Kommissar Kugelblitz is a famous series of books in Germany. To enhance the reading experience, we converted these books into Apps and ePubs. This book is a detective series and each book has different cases describing how the commissioner works. In total there are 30 books and each book has different chapters. We converted this into an app. To unlock the book one has to crack the password and after reading the book a series of questions will be asked which have to be rated and accordingly points are scored which in turn helps you get to higher levels. We have an iPhone, iPad and android app linked to the 30 books. 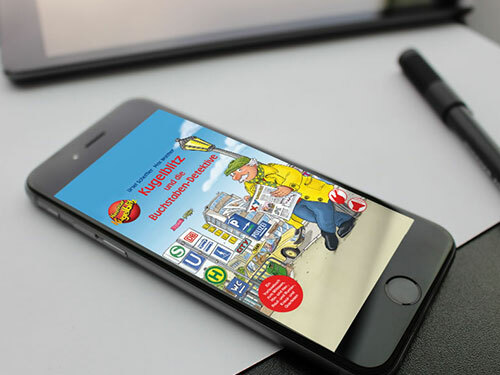 The App created makes reading more interesting as these books are one of the most famous series in Germany. Messages can also be sent via e-mail through a code and in order to decode it one must have the app installed. WITS Interactive delivered ePubs & Apps which were not only out of the ordinary but also a complete package.